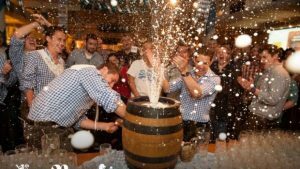 Today, the original Bavarian Oktoberfest has sparked off similar events all around the world, all with the aim of celebrating of these German traditions. While people from all corners of the earth continue fly into Munich each year, many more are attending Oktoberfest celebrations in another of the world’s cities. There are so many good things about Oktoberfest, you probably don’t need much persuasion! But just in case… for one thing, no excuses are needed for a few drinks – at Oktoberfest you can drink as much beer as you can possibly handle and nobody will bat an eyelid. It’s so much fun to immerse yourself in a festival atmosphere knowing that people all around the world are sharing this vibe with you… many of whom will be dressing up in dirndls and lederhosen and enthusiastically dancing to German folk music and doing the hand slap dance! Aside from the obvious – vast amounts of beer – it’s a great opportunity to try out unusual foods and drinks from Europe, including meats of all kinds, from pork or veal sausages to spit-roasted chicken (hendl), duck or goose. Grilled pork knuckles and roasted ox tails are the norm, but if meat isn’t your thing, how about some potato dumplings with red cabbage and apple (blaukohl)? Why not tuck into a pretzel, cheese plate, or delicious German dessert? Melbourne is a city that welcomes Oktoberfest with open arms, and there are so many options for celebrating it. You’ve got everything from outdoor festivals to German beer halls, local brewers, venues with an authentic German atmosphere, and of course lots of university fun. Oktoberfest in the Gardens is at Melbourne Showground on Saturday 13th October. Dress up and drink to your heart’s content in the city’s largest heated beer hall, eat at authentic German food stalls, watch various performances, dance in a silent disco and be entertained by a diverse mix of acts on various stages. Don’t forget to grab your tickets early! 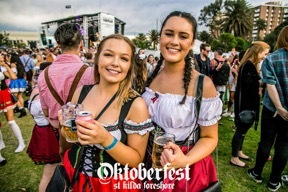 St Kilda does Oktoberfest in style every year, but this year they’re upgraded the venue and it will be held at Catani Gardens on Saturday 13th and Sunday 14th October. You can expect to find more than five stages and a whole host of acts gracing them, from live musicians to comedians. There are bigger bars (more beer than ever! ), a bigger silent disco than usual, best-dressed competitions and more. Hophaus will tell you that their event, Hoptoberfest, is like Christmas, New Year’s Eve and your birthday all rolled into one. Running from 5th – 14th October, they’ve got every delicious bier imaginable on the menu (including imported German biers), live music and DJs, a sausage eating competition and Dachshund races. Get your Lederhosen on and join in the fun! Every day from 28th September to 22nd October, Munich Brauhaus will be celebrating Oktoberfest. Over six weeks they’ll have 5 official biers on the menu ready to fuel the ‘biggest Oktoberfest party outside of Bavaria’. Eat from their supersized feasting menus, listen to Oom-pah-pah bands and grab your chance to win a trip to Munich. Bridge Road Brewers in the old coach house hosts Oktoberfest 2018 Ohm-Pah on Saturday 13th and Sunday 14th October. Sample world-class Beechworth beers, deck yourself out in Lederhosen or Dirndl and enjoy the ohm-pah band’s festive tunes. For an authentic German atmosphere, check out German Club Tivoli for an Oktoberfest celebration on 5th and 6th October. Feast on traditional, homemade German and European dishes and sup on dozens of imported German beers, wines, and schnapps. You can play billiards, darts and table tennis in the Bier Halle too. Once per week from 6th October until 27th, Cuckoo Restaurant also offers you German traditional food and festivities at their event, Okto Beer Fest. There will be live music, a German costume contest, Bavarian food, and a yummy Schnitzel fest! One for the students! University of Melbourne student union gets together on 5th October for Oktoberfest, university style. You’ll pay $35 for drinks, unlimited food and a stein, plus live music… and don’t forget your dirndl and lederhosen, they’re an absolute must here! 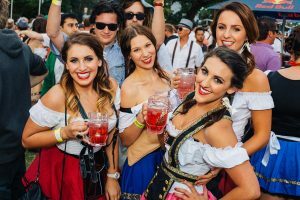 Oktoberfest is a seriously fun event in Melbourne, year on year. 2018 promises to be as entertaining as ever, so don’t miss out on the fabulous events happening all over the city. It’s time to master your slap dancing! Enjoy.